1. What is the survey’s purpose? – Respondents will want to know up front why they are being asked to fill out a survey. It is, therefore, a good idea to use your Email Invitation or Survey Welcome Page to provide a clear description of its purpose, an approximate time frame to complete and to thank respondents for their time. If you plan to incorporate respondent feedback into future decisions or business processes, it’s a good idea to share that information up front as well. 2. Keep it short – Creating a survey that takes five minutes or less to complete will generally produce the quantity and quality of results you are looking for. Certain surveys will require more time and details from a respondent (such as customer or employee satisfaction surveys). In this case, try and keep it to under ten minutes. 3. Keep it simple – Design the survey questions with your specific audience in mind, wording them carefully and clearly. It is important that the respondent knows exactly what you are asking them. 4. Get personal at the end – The least critical questions of your survey should come last in order to avoid losing respondent interest. If you are looking for specific personal or demographic information, leave these until the end of the survey and make them optional. 5. Be specific – Try and think of the bigger picture and how you are going to analyze the data you collect. A large number of open-ended questions will provide a wide range of answers in need of analyzing. Closed questions with limited options will make reporting simpler. 6. 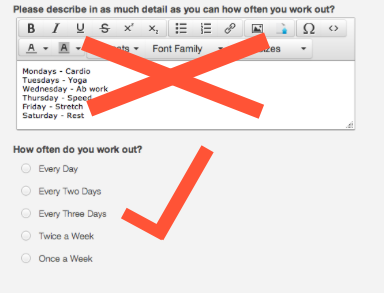 Consistency is key – A consistent survey question style, flow, and layout will help produce the most accurate responses. For example, if you use a rating scale of 1 to 5, with 5 being the best, make sure that all subsequent questions use the same rating scale. 7. Follow logic – One question should lead naturally into another. It is also a good idea to group questions that are similar in topic to the same page. Generally, initial questions should be broad in nature and later questions should be more specific. 8. Test, test, test – After testing the survey yourself, make sure you issue it to a sample of trusted employees or customers to ensure it works properly. This will give a good indication of response time as well as highlight any issues or confusing questions before you launch it to a broader audience. 9. Timing can be everything – Take your audience into consideration when determining the best time to deploy your survey. Typically avoiding weekends, Monday mornings, and Friday afternoons is best, but this may vary depending on your audience and survey purpose. 10. Send reminders – Don’t be afraid to issue reminders to those who have not responded. Set a deadline for obtaining the results and if a few days before the deadline you still have outstanding responses, then send a reminder. 11. Entice if necessary – It is important to give your respondents a good reason to take your survey. This does not necessarily have to be a gift or monetary incentive. Communicating to the respondents how important their feedback is can often be the best incentive. 12. Share – Last but not least, share the results of your survey with your respondents and let them know what actions you will take based on those results. This will help encourage respondents to take future surveys knowing that action is being taken.